Designed to deliver a faster, easier, and more intuitive solution for wound closure, BandGrip Micro-Anchor Skin Closures represent a major innovation in wound care. Using revolutionary micro-anchor technology, the device is already being used by leading orthopedic surgeons to improve patient experiences and deliver better healing results. Here are 5 Benefits of BandGrip’s Micro-Anchor Skin Closure Device. People don’t typically think of sutures as invasive, but they fundamentally involve introducing a foreign material into the body. With any kind of invasive procedure, there is always the risk of inflammation and infection. Sutures also require the use of a needle, which introduces the risk of a sharps injury. For some patients, the potential discomfort or pain associated with sutures can cause a great deal of distress. This is particularly problematic when it comes to children, who tend to be more averse to needles. BandGrip Micro-Anchor Skin Closures present a completely non-invasive alternative to traditional sutures. The device’s patented micro-anchors grip the skin firmly to pull wound edges together and hold them securely in place to facilitate speedy healing. Since the anchors do not penetrate deeply enough to reach the nerve endings, they generally do not cause any pain. BandGrip can be applied quickly and completely eliminates the need for any needles or invasive materials. Post-surgery, patients want to get back to their normal routines as quickly as possible. They don’t want to have to constantly worry about caring for their closed wound. Sutures are generally cut as close to the skin as possible, but there are often still “whiskers” that can snag on clothing or other fabrics. The fear of pulling a stitch or lingering soreness around the sutures can cause patients to avoid activity, which may slow the healing process or contribute to other negative outcomes. The smooth surface of BandGrip Micro-Anchor Skin Closures makes them far less likely to catch on any obstructions. Since they are non-invasive, they don’t inflict skin damage that could lead to inflammation, infection, or additional discomfort. For patients who need to resume activity quickly, BandGrip supports better ambulation than traditional closure modalities. Patients can even wear them into the shower 24 hours following application. 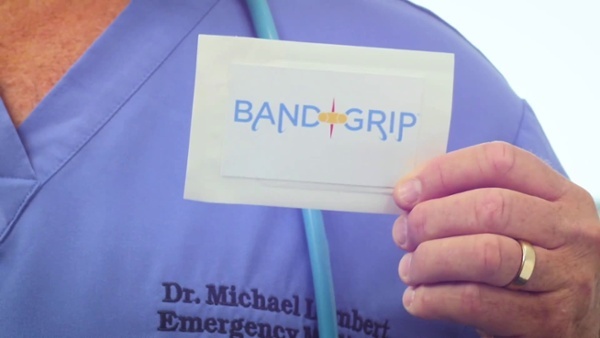 Since BandGrip covers surgical wounds completely, it also eliminates much of the concern over wound care that is often associated with sutures. One of the biggest concerns patients have following surgery is scarring. While most people understand that any surgical incision will leave behind a scar, they want some reassurances that the scarring will be as minimal as possible. Unfortunately, sutures can’t always provide those reassurances. In fact, if they aren’t applied properly, stitches can sometimes result in more serious scarring, leaving patients with a negative view of their surgeon’s work. BandGrip Micro-Anchor Skin Closures produce far better cosmetic results compared to other methods. The secure micro-anchors hold wound edges together to support a faster and less intrusive healing process. This results in better healing and less scarring, which helps improve overall patient satisfaction. In the operating room, speed is everything. Whether it’s hospital operating rooms trying to treat patients as quickly and effectively as possible or emergency rooms working through every critical case awaiting a doctor’s attention, every moment of time saved could have a dramatic impact on patient health outcomes. One of the areas where operating rooms can cut down on surgery time is during closure. With BandGrip Micro-Anchor Skin Closures, surgeons can close wounds much faster than with conventional sutures. And since BandGrip can be applied by any healthcare professional, a doctor isn’t necessarily even needed to close some incisions. This allows them to move on to more urgent cases or the next scheduled surgery, helping hospitals to treat more patients. Sutures utilize relatively inexpensive materials, but the skill needed to apply them often ends up increasing their overall cost. Sutures also introduce significant inventory costs for hospitals because there are so many different types of suture materials, some of which need to be used for certain situations. BandGrip Micro-Anchor Skin Closures offer a cost-effective solution for hospitals looking to cut down on excessive inventory. Since BandGrip is non-invasive, it can be utilized for a wide range of closures without causing concerns over inflammation, infection, or closure strength. More importantly, it can be applied by any medical professional, not just a doctor. This means that surgeons can spend more time delivering high-value care rather than dedicating their valuable (and expensive) time to performing simple wound closures. Hospitals and surgeons are often hesitant to adopt new medical technologies, but sometimes the advantages to doing so are quite clear. In the case of BandGrip Micro-Anchor Skin Closures, there are several ways in which this innovative new device presents an upgrade over traditional closure modalities like sutures. As more surgeons turn to BandGrip as their preferred choice for closure, those advantages are sure to become more widely known across the healthcare industry.